Join the discussion on our forums! 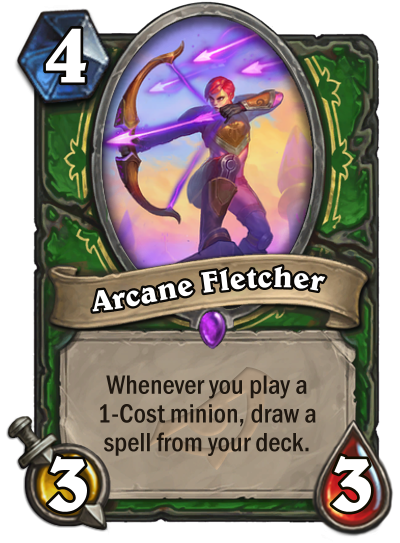 Come discuss Arcane Fletcher over in our dedicated Arcane Fletcher discussion topic. This card is SO fletch. WHEN I READ THIS FLAVOR TEXT!!! but he is too gay to function. Unfortunately, no one will see this comment, because nobody cares about this card. Also it requires you to put a healthy amount of spells & 1 drops in your deck. This actually gave me the win in a match yesterday. Fletcher > Springpaw > Kill Command drawn with 3 mana left and the springpaw activated the command. Hmmm... When I look at this card I see Face Hunter. It can get away with 1 drop spam and just about all of the spells you can draw are the burst you need to close out the game. In between Buzzards, Cult Masters, Infest, Cybertech Chip, Tol'Vir Warden, and even Halazzi, this still can build a place for itself in a quest hunter. Not the odd variant, for obvious reasons, but with Keleseth already removing the Chip and still relatively recently nerfed Hunter's Marks, this could make some things work. Might be a sleeper, card-draw in hunter is really scary. Springpaw with this is a decent draw-engine.